The aim of this work is to provide a way to identify the species of hornworts growing naturally in the state of Oregon, U.S.A. It also provides a summary of the distribution and abundance of each species. This work will be useful in the adjacent states, as well. The hornworts belong to the division Anthocerotophyta. 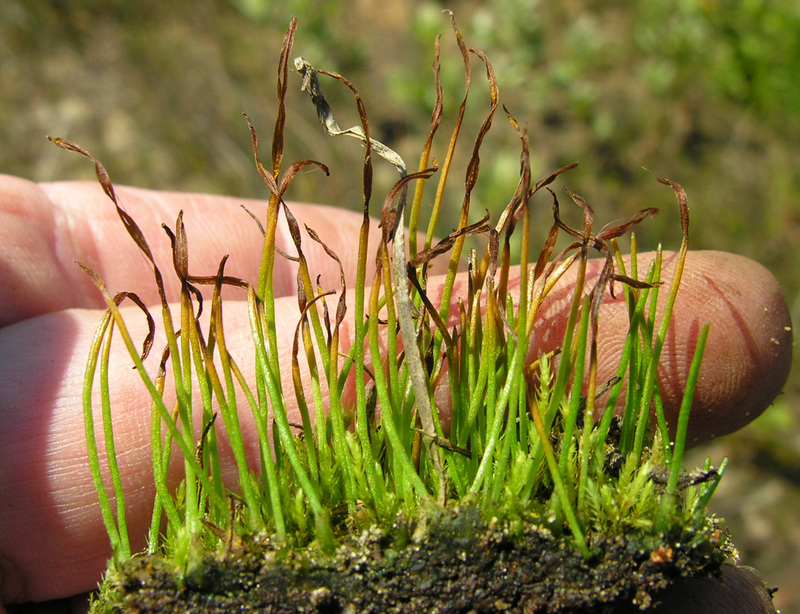 The taxonomy of the hornworts is currently in a state of flux as systematic research is actively underway at present. Circumscription of families is not even settled. For this reason, it is convenient to refer to them collectively as hornworts. The three genera treated here are those I believe are reasonable to recognize in Oregon and adjacent states: Anthoceros, Phaeoceros, and Phymatoceros. Future work is likely to produce alternate classification schemes, with additional genera and species separated from those accepted here. Hornworts of our area are most likely to be taken for thalloid liverworts by botanists not familiar with them. The presence of slender, acicular (needle shaped) capsules, the horns, make fertile plants easy to notice in the field. 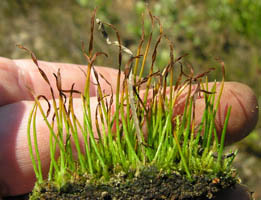 The capsules grow upwards from an intercalary meristem which is located just above the foot of the sporophyte. The foot is embedded in the gametophyte, with a sheath of gametophyte tissue surrounding and supporting the base of the capsule. When spores are ready for dispersal, the capsule splits into two valves vertically from the top down. 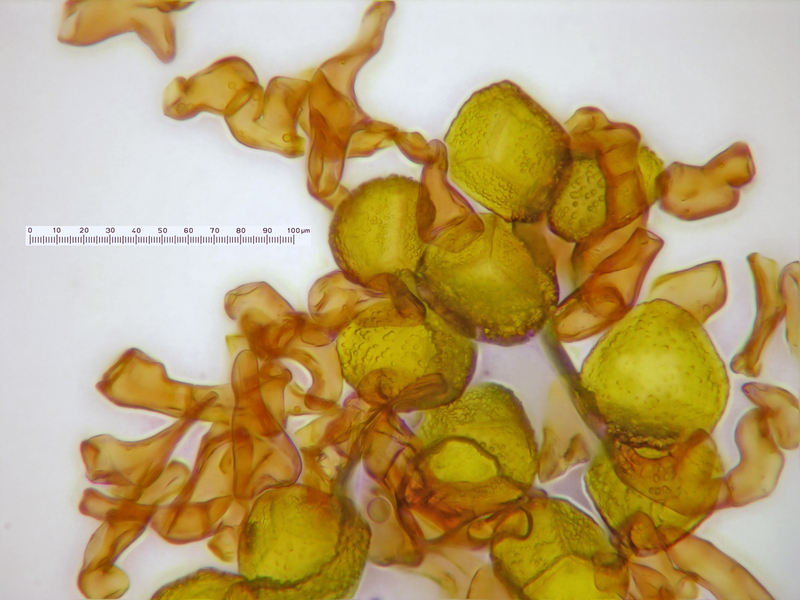 Sterile plants are positively identified by mounting a fragment of thallus on a slide in a drop of water under a coverslip and viewed with a compound microscope. Hornworts have a single, large chloroplast in almost every cell, occasionally two to four. 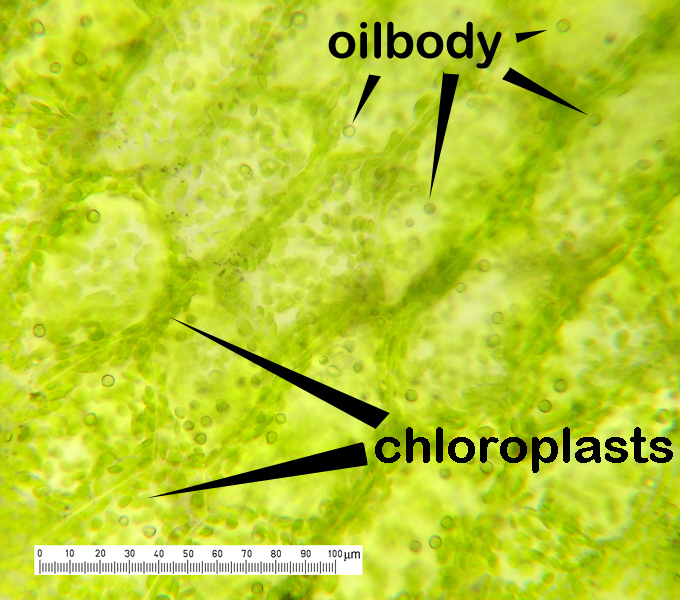 All liverworts, in contrast, have numerous chloroplasts in each thallus cell. 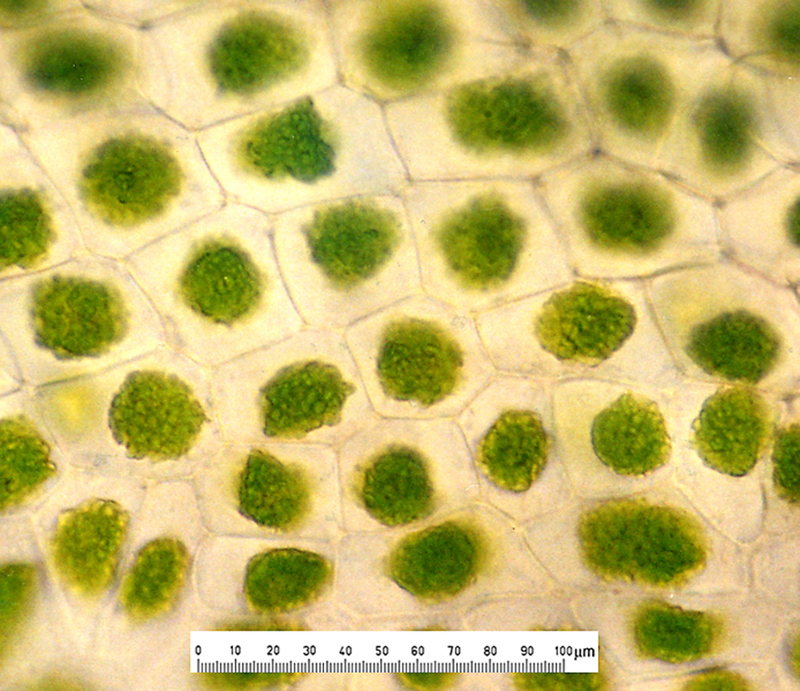 Left: Surface cells of Anthoceros fusiformis, a hornwort. Right: Surface cells of Aneura pinguis, a thalloid liverwort. 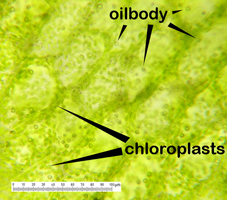 Although it is easy to identify a hornwort based on the number of chloroplasts in its thallus cells, and relatively easy to distinguish genera in the field with hand lens observations, species identification is dependent on observing details of spore morphology at high magnification with a compound microscope. Keep this in mind when gathering specimens for herbarium vouchers. Capsules that are not mature, at least at the tip, are unsuitable. An ideal stage is shown above with Phaeoceros carolinianus. It is a good idea to pick out several mature sporophytes and place them in a micropacket when drying the specimen. This way there will be at least a few spores available for future study which are not contaminated with the dirt that always accompanies a dried specimen. Spores develop in tetrads before separating at maturity, appearing like four balloons pressed together. The result is that each separate spore has a rounded outer surface, the distal face or aspect, and an inner surface with three faces separated by a triradiate ridge, the proximal aspect. Ornamentation on the distal surface is usually quite different from the proximal face ornamentation. It is traditional to illustrate spores with both distal and proximal views. Drawings are often inadequate to demonstrate spore ornamentation so I have made effort to provide photographs of spores of all species at high magnification. Phaeoceros oreganus. Spores: left, distal view; right, proximal view. Coyote Prairie, Lane County, Oregon. DHW m2691a. Among the spores are pseudoelaters composed of one to several elongated cells. They are called pseudoelaters because they do not have the spiral thickening found in liverwort elaters. The pseudoelaters are composed of 2-4 cells in most species. In our region only Phaeoceros hallii has strictly unicellular pseudoelaters, a valuable distinguishing character. Phaeoceros oreganus. Spores and pseudoelaters. Coyote Prairie, Lane County, Oregon. DHW m2691a. A scanning electron microscope (SEM) produces the best, sharpest images of spores. The SEM pictures included here were prepared by Bill Doyle and are used with his permission. However, it is not always easy to compare SEM images with spores being studied with a light microscope. My illustrations of spores were made by ordinary light microscopy, using an oil-immersion lens for maximum magnification. They were photographed mounted in water because the contrast is greater than that obtained in mounting media (including plain glycerine) whose refractive indices are close to that of the spore coat. The spore pictures are stacked images, produced by taking many photos and merging them into a single image with good depth of field. Helicon Focus software was used to make many of these images, others were stacked manually, and some using a combination of techniques. If the digital processing produced excess color distortion, the spore pictures have been converted to grayscale. The spore gallery will help with making an identification when a spore preparation is at hand. The black spored species are easily distinguished. The yellow spored species can be sorted into two kinds, two with finely echinate spores and two with bumpy spores. Separating the species with similar spores will require using the key in conjunction with the species descriptions. Each page in this key is a couplet with two contrasting leads. Decide which lead best fits the specimen being studied. Click on the highlighted part of the lead to go to the next couplet or to a species page. Every page has a link to the home page at the top and bottom as well as a "GO BACK ONE STEP" link. At the top of every page there is a line of breadcrumbs. This is a series of links to the leads in each couplet taken to arrive at this page. It is a shorthand record of choices made. One can go back to any step in the keying process by clicking on the appropriate phrase in the breadcrumb trail. Clicking on the first breadcrumb will take you back to the start of the key. All images on the key pages and the species pages are thumbnails. Click on a thumbnail to see a large image. They have been saved at 600--1000 pixels high to retain reasonably good resolution for viewing and printing. After viewing the larger image, use the back arrow ("Show the previous page") to return to the page on which the thumbnail was located. From home page go to Index of Species to find a list of all names with authorities. I like to post this index on my browser bookmark bar because at any point I may want to go directly to a species page to check if a specimen in hand fits the species descriptions and to see additional pictures for comparison. I am deeply indebted to William T. Doyle, Ray Stotler, and Barbara Crandall-Stotler. These three have been invaluable mentors in my study of hornworts for many years. I particularly appreciate Bill Doyle giving permission to include his SEM images and for his critical review of the document. Bill's review has been essential for maintaining a suitable level of accuracy of treatments. Alan Whittemore has also given me useful insight into this group. Ken Kellman, Jennie Sperling, and Veva Stansell have made important gatherings of rare species. Ed Alverson alerted me to a critical hornwort community in the West Eugene Wetlands. Daphne Stone and Dave Kofranek provided comments in reviewing an earlier version which have improved the quality substantially. I thank the curator, Richard Halse, and director, Aaron Liston, of the herbarium at Oregon State University (OSC) for providing space for study and other courtesies. Almost all the specimens cited here are housed at that institution, including those cited as ORE. The few that are currently being held in my personal reference collection are cited as DHW; they are destined to be eventually deposited at OSC.